Top 5 Questions on What Caused my Crohn’s or Colitis? 1. What caused my Crohn’s or Colitis? While we don’t know the clear-cut real causes, there have been found many correlations to those who have certain risk factors and those who develop Crohn’s or Colitis. 2. Which vitamins, diets and healing plans work best for Crohn’s or Colitis? Every person’s healing plan will be different and ideally you want to work with a functional medicine specialist experienced with digestive illnesses. Nutrients and detoxification play an integrated role in recovery from chronic illnesses. Foods that give you energy and don’t cause pain later. Foods that you enjoy! Eating should be satisfying. 3. What is the best way to deal with craving? The wrong gut bugs can cause cravings for carbohydrates, fats and sugar. They also release toxins like lipopolysaccharides (LPS) that trigger inflammation, insulin resistance and cause weight gain. Do you have cravings for carbs, fatty foods, sugar? Are you sure they are YOUR cravings? Probably not! The microbes in your gut signal for the foods THEY want. And when they get their way, they produce dopamine to reward you and tell your brain that donuts are a great idea. The best way to get rid of cravings for good is to feed a healthy microbiome so your gut bugs help you make better decisions. +Avoid pesticides, GMO’s and chemicals. ++If that doesn’t work… test, don’t guess!! A comprehensive lab. GI-MAP is one of most influential tests in our clinic. 4. Is there one thing that we can change to improve gut health? I hate to break the news, but there’s way more to the story of gut health. So, if you have eczema, psoriasis, anxiety, depression, autoimmune diseases, chronic pain, reflux, PMS and other hormonal issues…. Then you likely have a gut problem. Our digestive tract is a critical hub for our health. If you think about it, we put food from OUTSIDE our bodies INTO our bodies, and expect it all to be ok! When we feed our bodies primarily whole, real, minimally refined foods, those foods shift our gut microbiota and are truly the foods that help us thrive. They’re the foods that make for a happy gut. So, what can cause assaults on our GI tracts? Sometimes steady shifts in eating can be enough to resolve issues and sometimes testing can be necessary. But gut problems come in all shapes and sizes—not just poop problems! Did you know that I work with clients all over the world via video conference? 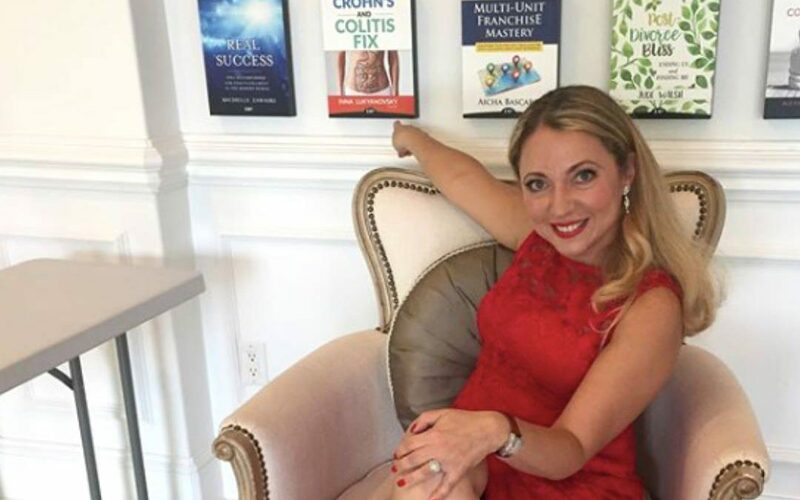 I do this because I know how incredibly difficult it is to find someone you trust to include in your health team when overcoming chronic digestive problems. So, if you’ve been hesitating to reach out because you don’t live in the NJ or NY area, now you know!! 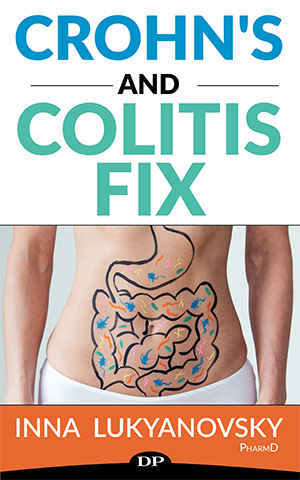 If you want to know more about my approach, download my book, The Crohn’s & Colitis Fix. 5. How would hormone balancing be tied to gut health? Hormone balance is very sensitive to stress, inflammation, toxins, poor diet, sleep deprivation, lack of exercise, too little sunlight, and other common factors of modern life. Because the reproductive hormones play an important role in brain health, mood, and brain inflammation, when they’re off, brain function and mood suffer. In women, imbalances are characterized by excess estrogen, insufficient progesterone, or too much testosterone. Stress and blood sugar that is either too low (hypoglycemia) or too high (insulin resistance) are the most common culprits of PMS symptoms and a miserable menopause transition. Ideas to halt pregnenolone steal include an anti-inflammatory diet, stabilizing blood sugar, restoring gut health, dampening pain and inflammation, and managing autoimmunity. These are functional medicine basics. Make sure you are eating the right amounts and kinds of essential fatty acids. Additionally, certain botanicals are effective in supporting female hormone health and the body’s stress handling systems. Contact my office for more advice! What is so special about Functional Medicine? A WordPress Commenter on Top 5 Questions on What Caused my Crohn’s or Colitis? Healthy Gut is paramount to keeping immune health in check. Are you keeping your gut flora in balance? Enter your email to access the content. Biohacking means you are using technology and science to make your body function better and more efficiently.